Close your eyes for a moment and pretend you are picnicking, during the mid-afternoon, with family and friends in Central Park. About a two football fields away you can see a softball game. You can see the men and women cheering as ballplayers smack the ball and race around the bases. You see a player slide into home plate and you watch the umpire signal him out. You can see all this action, but you cannot hear it. Later that night as the temperature cools and other softball teams are playing under the lights you can see and hear everything clearly. Why is this so? Could it be, during the day, you were situated in an acoustic shadow? During the day the sun heats up the earth’s surface, warming the air close to the ground. Sound travels faster in warmer air. So the sound travels faster in the air close to the ground. The reverse happens at night. At night the ground cools quickly. 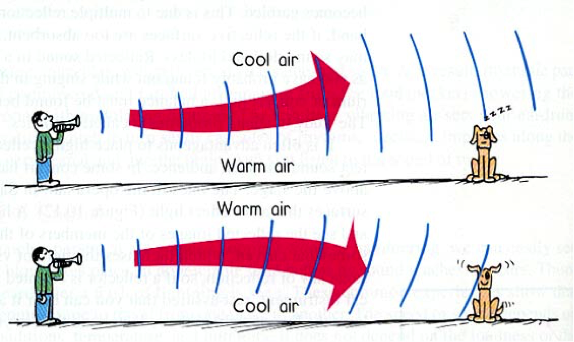 The higher air is warmer than the air close to the ground. During the day the sound travels faster near the ground. This causes the sound wave to refract upwards. At night the opposite happens. The sound further from the ground travels faster at night causing the sound wave to refract back towards the earth. In the 1800s Osborne Reynolds performed the first sound wave refraction recorded test. He placed a ringing bell, one foot above the ground, and crawled twenty yards. He had to lift his head in order to hear the ringing sound. He then crawled seventy yards and had to stand before he could hear the ringing sound. In 2001 Charles D. Ross published a book called Civil War Acoustic Shadows. In this article we are going to explore the phenomenon of sound wave refraction and how it relates to the sounds of war the formation of acoustic shadows. In the early 20th century, with the use of hot air balloons, scientists started to learn more about our atmosphere and its different layers. In 1923 atmospheric temperature changes were documented while studying meteors. In 1924 Erwin Schrodinger, a Nobel-Prize winning Austrian Physicist, suggested that “low-frequency sounds would be absorbed less in the atmosphere and would therefore be refracted back to earth more strongly than high frequency sounds”. The layers that house our ozone tend to be warmer due to the captured radiation from the sun. When the sound wave hits this warmer layer, it’s refracted back towards the earth. 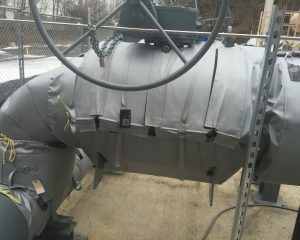 Wind also plays an important role in the refraction of sound waves and ultimately on the distance they travel. Wind traveling directly into an oncoming sound wave will make it refract upward more sharply. Wind traveling in the same direction as a sound wave will make the sound wave refraction more gradual. In the upper atmosphere a strong wind traveling in the direction of the wave will push the wave further and faster. Before the age of modern technology army commanders relied on sound of to guide them with their military decision making process. Many times, to their detriment, commanders made decisions based on what they were hearing. Many were caught in the sound shadow no-man’s land. The first recorded sound shadow effect happened at sea between the coasts of England and Holland. 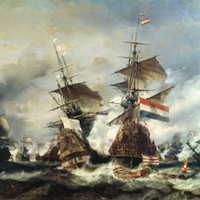 For four days the English Navy fought the Dutch Navy off the coast of Dunkirk during the second Anglo-Dutch war. 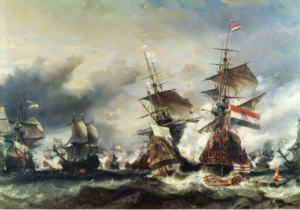 Historians credit the larger Dutch Navy with the victory. During the battle, non-combatant boating passengers situated at sea in a shadow zone somewhere between the battle and the coast of England did not hear the battle. On the other hand the battle was heard throughout various locations in England. During the first World War, on the 28th of September 1914, German artillery began shelling the Belgian city of Antwerp and the fortifications that protected the city. The acoustic shadow zone started approximately thirty miles from the artillery and ended at about sixty miles away. After the sixty-mile mark, the German artillery bombardment was heard. The people within the thirty to sixty mile radius of the artillery could not hear it. On September 19th 1862 General Grant planned to attack Confederate Major General Sterling Price near the small town of Iuka, Mississippi. The plan was for Union Major General William Rosecrans to attack Price first and then upon hearing the battle Grant’s Major General Edward Ord would move his troops in to prevent Price from retreating. Ord was to engage his troops after hearing the sounds of battle. Those sounds never came. 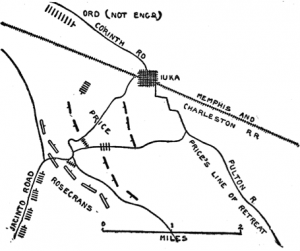 As Rosecran’s army engaged in battle with the confederates all afternoon, Ord and his army, situated in an acoustic shadow, never heard the battle sounds and ultimately never attacked. Price retreated and ultimately, for the time being, saved his army. At Gettysburg July 2nd 1863 General Lee issues a command for Lieutenant General James Longstreet to attack the round tops – the south end of cemetery ridge. The hill top was virtually undefended. Lee hoped to get his cannons to the round tops so the confederates could bombard the union troops with cannon fire. 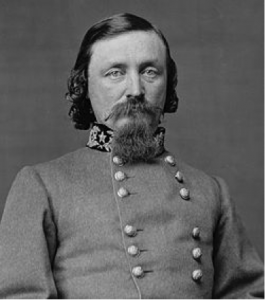 Upon hearing Longstreet’s attack, Lieutenant General Richard Ewell was to attack from the left. He was to order his men to attack as soon as he heard Longstreet’s barrage of cannon fire. He never heard Longstreet’s cannons. Ewell and his army found themselves situated in an acoustic shadow. Meanwhile, the Union’s Major General George Meade moved men from his right to his left to stop Longstreet’s advance. In 1865 Lee had his army situated outside the city of Petersburg Virginia. Lee correctly guessed that Grant would look to attack his right flank. 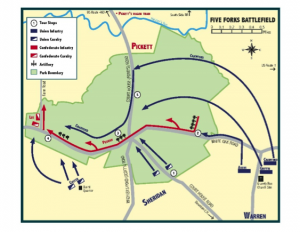 Lee sent General George Picket with the army of northern Virginia, five thousand confederate soldiers, down to Five Forks to dig in and set up dirt and wood defenses. Lee understood the need to hold this area in order to protect his southern supply railroad open. 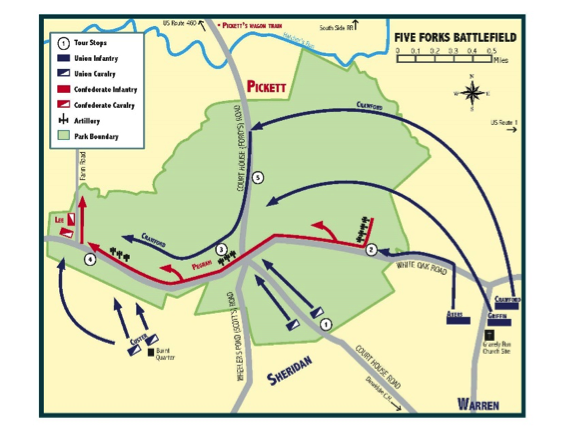 Grant knew this strategic importance and sent his Union Major General Phillip Sheridan to attack Lee’s left flank at the Five Forks. On the morning of the attack, confederate Major General Fitzhugh Lee invited Picket along with Major General Thomas Rosser to a fish bake two miles away from Picket’s front line. Picket neglected to tell him men that he was leaving. Historians speculate that he did not tell him men, who were probably hungry and malnourished, because he felt guilty. While enjoying baked shad and some alcohol, Sheridan and his commanders assaulted Picket’s defenses ultimately decimating Picket’s forces and taking thousands prisoners. As the battle raged two miles from the fish bake, Picket and the other commanders heard nothing. Late in the afternoon, Picket decided to send a courier to check on his men. As the courier rode off in the distance the generals, to their horror, could see their courier taken prisoner by the advancing union troops. Picket jumped on his horse and rode to his men but it was too late. The confederates suffered a major defeat — one that would accelerate the coming end of the civil war. Picket and his commanders were caught in an acoustic shadow. That afternoon while the generals thought they were enjoying a quiet uneventful relaxing fish bake, their world was collapsing. 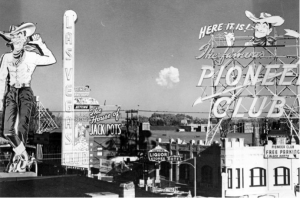 In 1951 the United States Government detonated a nuclear bomb sixty-five miles away from Las Vegas. The test shattered windows in Las Vegas. The bomb testers discovered that the sound waves from the bomb refracted upward and downward six times before hitting the Las Vegas. The waves were refracted upward in the atmosphere and then refracted downward back to the earth’s surface every eleven miles. At 30 degrees Celsius, the speed of sound is 349 m/s. 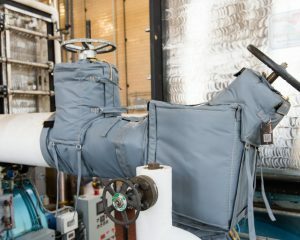 When environmental engineers look to minimize industrial noise to surrounding communities they must consider the concept of sound wave refraction and its acoustic shadow effect. Industrial noise, in areas immediately surrounding the factories, will be greater at night than during the day. Take a look at the oil refinery in the photo below. The surrounding community will hear little of the sounds emitted from the stacks high above the refinery during the day. The sound waves from these sources will ultimate refract upward. Communities located many kilometers away will here this noise. However, during the night is a different story. 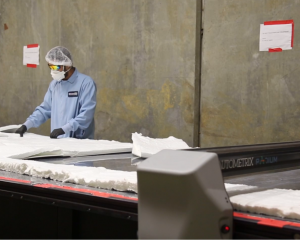 These waves will be refracted right onto the community. Let’s say a stack is emitting sound wave 20 meters above the ground. 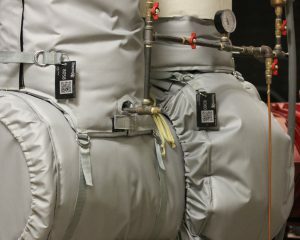 Engineers need to calculate the angle of refraction in order to determine how to best combat this phenomena and ultimately reduce decibel levels to surrounding community. In a follow up article, “Proposed Math for Refracting Sound Waves,” we will propose new math used to calculate the and angle of refracting (bending) of sound waves. Later this year, we also intend to conduct an experiment similar to the one performed by Osborne Reynolds in the 1800’s. Look for this article sometime in September, 2015.